It is the journey that makes Hand of Fate interesting, the play of the game that matters. How much does changing a game's presentation change the effect that the game has on its player? Does doing so compensate for a genre that's been going stale and material that is, by this point, routine? These are the questions that Hand of Fate asks as a result of its very existence. Hand of Fate is a set in a generic fantasy land with little to no detail at all, let alone detail that would differentiate it from others. You will fight marauding bandits, rat people, lizardmen, and the undead as you push ever forward towards an ambiguous goal. Other than enemies, along your journey you will meet merchants, Elven maidens, and people in need of aid, or possibly environmental hazards like treacherous swamps, ever expansive deserts, or a demon carnival. There is no central story to speak of, just a long series of encounters repeated ad nauseam. Hand of Fate leaves out most of the heavy lifting done by virtual worlds in favor of human imagination. A paragraph here, the right tonal music there, maybe a couple of options to make a choice based upon, and the human mind will fill in the rest. The story is left vague and archetypical to give a mythic sense to the journey. The end goal is never fully explained, and we only see the world through a series of disconnected peepholes without any understanding of how the various images are supposed to connect to one another. The material itself, as bland as it is, seems fresh by virtue of its presentation. Hand of Fate throws out what it finds ultimately unnecessary. Gone is the open world or any world space at all to speak of. You don't travel anywhere. Instead, you move your piece across fortune cards set down on a table to mimic the act of traveling. The game opens with your character sitting down across the table from a mysterious fortune teller known as The Dealer. He has the ability to reconstruct your past and make you relive an ever remixed version of events through an ever expanding deck of cards. Our journey jumps us from dungeons to deserts to swamps to seaside cliffs with little cohesion between events. The Dealer is the constant. He is the anchor to this journey spliced across time and space. 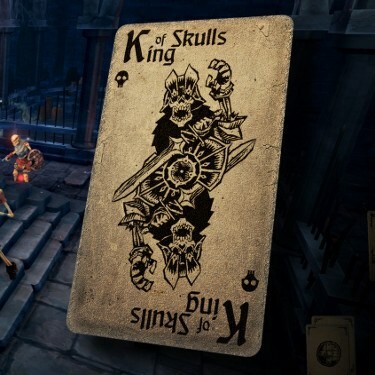 You start off with a basic set of cards and gain new ones as you complete challenges or if the story a card tells begins a chain, it replaces itself. Once you've put together your deck, The Dealer deals them out face down in patterns and places your token on a starting card. From there, you can move to any adjacent card, which he then flips up and tells you of your encounter. They all offer a snippet of set up. Some of them are actually quite extensive, offering the player multiple choices as how to react. Sometimes the situation presents a degree of chance as to what the outcome will be, and as cards are shuffled, three card monte style, four cards imprinted with success, failure, huge success or huge failure in differing combinations depending on the challenge. Once you reach the end of each "floor," a whole new set of cards is dealt in a different pattern. Eventually you reach the final floor of a run and fight the boss. Some of these encounters are just a lead up to combat or can become a lead up to combat should you choose poorly or get unlucky. This is when the game will deposit you in a 3D environment that will act as the arena to fight a bunch of randomly assigned foes, again decided by drawing cards. The combat itself comes with the tempo of third person action games, the kind that has become popular recently, taking pointers from the Batman: Arkham games. There is more to fear, however, than just potential dangers. There is an element of resource management that adds weight to each hit, each unlucky encounter, and each charitable donation. Health carries over from encounter to encounter. Take too many hits in one combat arena and you'll be left more vulnerable in the next. Each step across the dealt cards consumes a unit of food. Run out and you'll be losing health instead of gaining it back with each move. Then there is the gold needed to buy healing, food, and equipment upgrades as they reset after each run. These elements add a layer of tension that can ultimately devolve into frustration. They are abstractions related to, but disconnected from, the grounded reality of our character. The game is able to keep things fresh and interesting through a steady stream of new event and treasure cards. Even a run that results in failure can still create progress. Beating a new challenge before ultimately dying unlocks new cards to put into your decks. Or maybe you'll land on a newly unlocked card and remove the mystery behind what it does. Over the course of the game, there will be a lot of repetition as you land on the same encounters again and again. So much so that they lose their mystery and become familiar. Especially near the end when the difficulty of the runs spike, forcing them to be replayed many more times. By this point, many of the encounters have already been unlocked or are much more challenging to unlock and new cards become fewer. The infinite promise that one's imagination once generated starts to fade and the encounters lose the spark of wonder they once held. This is not a journey of deep characterization and motivation. We do not know what the whole endeavor has been about in the end. Thankfully, it is not the end that concerns us. As the tired saying goes, it is the journey, not the destination, that matters. Each run ends in death or the defeat of a boss. Beating one boss unlocks the next, and we begin the cycle again. It is the journey that makes each cycle interesting – it is the play of the game. This is a fact that The Dealer is so kind as to continually remind us of; we keep coming back to try again. The game is a compressed mix of past, present, and our own future as the wheel turns again.